A letter comes to Bernard’s home with a request from help from his good friend, Green Tentacle. Bernard once went to The Mansion to rescue a friend five years ago, but it looks like it’s time for him to go… “BACK TO THE MANSION.” Bernard returns to the Mansion to free his friend, but he also makes the mistake of releasing the clinically insane Purple Tentacle. Purple Tentacle had drink of the sewage flooding into the water below the Mansion. He was already pretty crazy but now he’s grown arms and vows to take over the world. The Mad Scientist, Dr. Fred, comes up with a scheme to easily recover Purple Tentacle. It involves sending Bernard and his two friends, Hoagie, and Laverne back in time to stop Purple from drinking from the sewage. He sends the three back in time but somehow skimped on one vital component of the Time Machine… the power source. The Imitation Diamond blows which sends Hoagie to the Past and Laverne to the Future. Bernard must now discover a way to stop Purple Tentacle and also rescue Laverne and Hoagie in the process. Since this is a remaster, let’s get right into what’s changed from the original. The first thing we’ll notice is the upscale to wide-screen and beautiful 1080p. Second, we’ll notice the distinct upgrade of the character models and the environments. 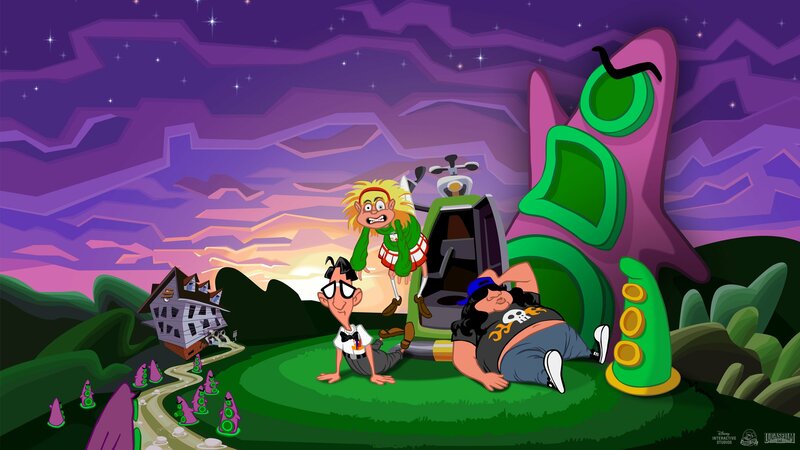 Maniac Mansion: Day of the Tentacle always had beautiful visuals, but now it looks like a cartoon come to life. One of the biggest differences from the original is the complete overhaul of the interaction system. The interactive words have been removed from the UI and replaced with a selection wheel. It’s a lot easier than dragging the mouse down to a slew of words to interact with an object you’ve already clicked on. It also cleans up the lower half of the screen to allow us more access to the glorious visuals. The sound has been greatly improved when compared to the classic version. The midi tracks were completely remastered and the voice work is much clearer. A couple of slice of life changes didn’t make it into the remaster. Mainly, that you can’t interact with a new item once the characters begin walking to a new area. You have to wait for Bernard and is friends to finish walking before selecting something new. Secondly, there are a few sounds that haven’t been updated in the Remaster. There is a room with a snoring man and Bernard even comments on how loud it is, but the sound doesn’t exist in the game. It’s a little bit of a nag but it happens in enough places that it’s noticeable. Another thing that needed a change is how many items can be placed in the Porto-potty to transfer to the different characters. It’s kind of pain to transfer an item into the Porto-potty switch characters and have to do it again for the next item. If there was a way to put multiple in and remove them all at once it would be more convenient. Nothing has been altered much in the form of gameplay from the classic release. It’s still a wonderfully designed adventure title with absolutely hilarious cutscenes accompanying every puzzle. Just be warned that it’s still as much of a classic adventure game as it has ever been. Most of the puzzles are fairly easy to figure out but there are some really obscure hints for some others. Day of the Tentacle is not solely to blame for this. A lot of classic titles like these give a hint once and expect you to remember what that person said even hours later in the game. These moments happen quite often and since Day of the Tentacle is fairly open ended. You’ll find yourself with tons of items and no idea how to use them. Some hints are also incredibly vague, like the mention of a car wash bringing rain that happens in the future. However, the actual car(t) washing needs to happen in the past. At least the design team pokes fun at these hints with achievements regarding some of the more insane hints. 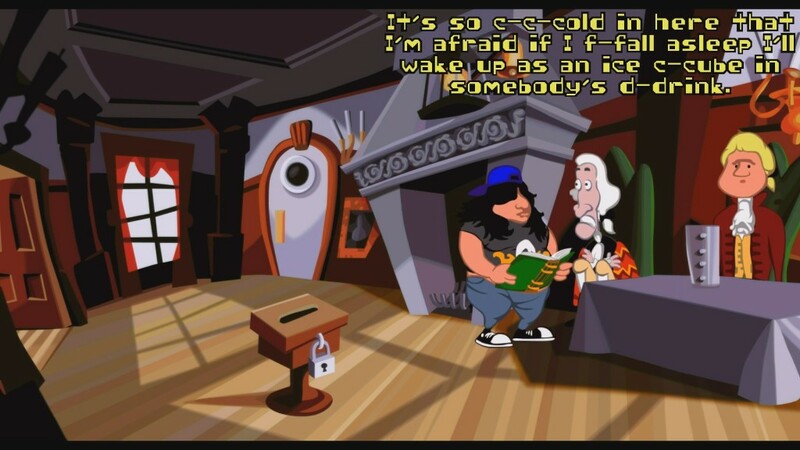 The best thing about Day of the Tentacle has always been the hilarious script and interaction with the various characters. The jokes still stand up well for this day and age as I found myself chuckling from the multitude of interactions with the cast. I couldn’t help but laugh at teeth chattering George Washington and the constant updates on Purple Tentacles’ rise to power. For all the upgrades that the remaster performs, it definitely didn’t need any in the humor and story department. Maniac Mansion: Day of the Tentacle Remastered looks amazing, sounds amazing, and has a hilarious storyline to keep the gameplay moving forward. It can also be slightly ambiguous puzzle wise but we’re all in luck that the game is old enough to have tons of guides available. This is one of those games that makes me miss the Lucasarts that used to make these awesome games. 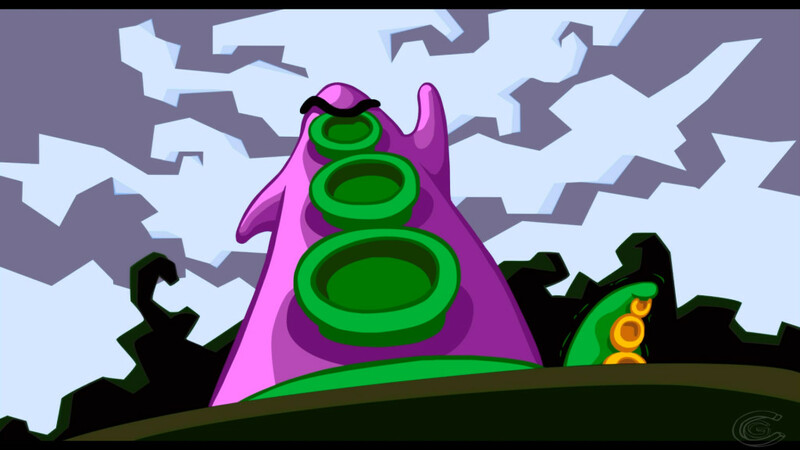 Day of the Tentacle is one of those games that innovated the adventure genre. It’s funny that this game from 1993 has more ground-breaking measures than a lot of adventure games released in 2016.